Manufacturer of a wide range of products which include steel name plates. 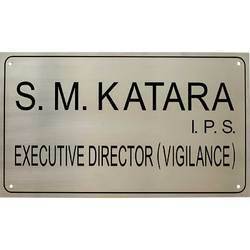 Ours is an illustrious organization, engaged in manufacturing and supplying a wide range of Steel Name Plates. Used for identifying person's or product's name, our offered plates are manufactured using high-grade brass that is obtained from the authentic vendors of the market. Easy to be placed on doors or walls, our offered nameplates are custom-made as per the specific demands of clients.